SPOILER! Just as you were trying to process the death of Kanan Jarrus (Freddie Prinze Jr.), Star Wars Rebels follows up on the tragedy with Dume. Episode eleven of season four is the aftermath of the most seismic event in the series yet. Phoenix Squadron struggles to cope with their loss, while the Empire has been dealt a serious blow. They took out the Jedi, but he crippled their entire operation on Lothal. It is a bittersweet victory that becomes more mysterious with the reappearance of the Loth-wolves. Dume begins with Governor Pryce (Mary Elizabeth McGlynn) dealing with the consequences of her actions. They did kill Kanan Jarrus, but the rebels escaped; and the fuel depot on Lothal was destroyed. The TIE Defender factory has been closed. Pryce tells her subordinate to keep that news quiet. She will throw a parade to celebrate the Jedi's death; hopefully covering her foolish moves. Ezra (Taylor Gray), Hera (Vanessa Marshall), and Sabine (Tiya Sircar) return to their hidden base. Zeb (Steve Blum) races gleefully to meet them, before realizing something is horribly wrong. Sabine runs away from the ship crying. Hera walks quietly unto the Lothal plain. Zeb grabs Ezra, who sadly explains that Kanan is "gone". Zeb embraces the teenager, as he realizes what has happened. Chopper gently approaches Hera. The droid offers his "hand" as Hera stares heartbroken toward the horizon. The remaining rebels gather around, listening to the Imperial declaration of the victory parade. Ryder Azadi (Clancy Brown) wonders aloud what their plan is. Hera, cradling the Kalikori, ignores him completely. She walks in silence to the cave. Ryder asks Ezra to contact Mon Mothma for reinforcements. Ezra replies that she will not send any. They have been defeated on Lothal. Sabine retorts angrily that she will bring "fireworks" to the Empire's celebration. She and Zeb take off towards Lothal City on speeders. Ezra sits alone in his grief. He is stunned to see the white Loth-wolf approach him. Suddenly he is surrounded by two more. They grow fierce and aggressive. He takes off running unto the plains. They give chase. He doesn't understand what they want from him. He runs and runs, until he collapses from exhaustion. Grand Admiral Thrawn contacts Pryce via hologram. She shows him the lightsaber of the fallen Kanan Jarrus. He is absolutely furious. Did she really think throwing a parade would mask her stupidity? By destroying the fuel depot, she handed the rebels a victory they could have never accomplished. The TIE Defender factory has stopped production. He coldly promises to deal with her in person. Thrawn than turns his attention to Rukh. The rebels will be angry and confused without their leader. They will strike back in anger. Find them and wipe them out. Hera is sitting in the cave, overcome by sadness. She cradles the Kalikori, but curses herself for waiting too long to express her love to Kanan. Meanwhile, outside Lothal City, Sabine observes how big the Empire has become. Zeb disagrees, he points to the idle smoke stacks of the factories. When have they ever seen the Empire shut down, never. Kanan did not die in vain. They have actually achieved a huge victory. Zeb knocks out a stormtrooper, then Sabine hacks into the communicator on his speeder. The destruction of the depot has closed all factories. Sabine tells Zeb that Kanan completed the mission. The parade is just a ruse to cover up the Empire's staggering loss. The trooper wakes up to an annoyed Rukh. He smells something in the distance, and walks off. The trooper notices the communicator has been tampered with. As he goes to touch it, the speeder explodes, killing the stormtroopers. Zeb is admiring their handiwork through the binoculars. He then realizes that Rukh is staring directly at him. He hands them to Sabine, who is shocked to see Rukh heading right for them. But they're not running from the assassin. They decide to set a trap and take him down. Rukh approaches Zeb. They engage in a fierce battle before Sabine, in her armor, ambushes Rukh from behind. Rukh activates a cloaking device and vanishes. Sabine switches to a thermal view to see him. He flips over and knocks her helmet off. Rukh pummels them both, until Sabine is able to plant a paint grenade on his neck. It explodes, marking him yellow, allowing Zeb to beat him unconscious. They don't kill him. Sabine paints him in rebel colors, then puts his limp body on the speeder. Ezra wakes up under a brilliant, starry night. He is utterly lost. He sleeps again, but is then awoken a new Loth-wolf, with a symbol on its forehead. It growls, "I am Dume". Ezra is stunned to hear his master's real name. I am assuming that Kanan's spirit has somehow been transformed into the wolf. Ezra breaks down, admitting that he is lost and broken without his master's leadership. The wolf whispers that he must fight. Another wolf places a tablet in front of him. 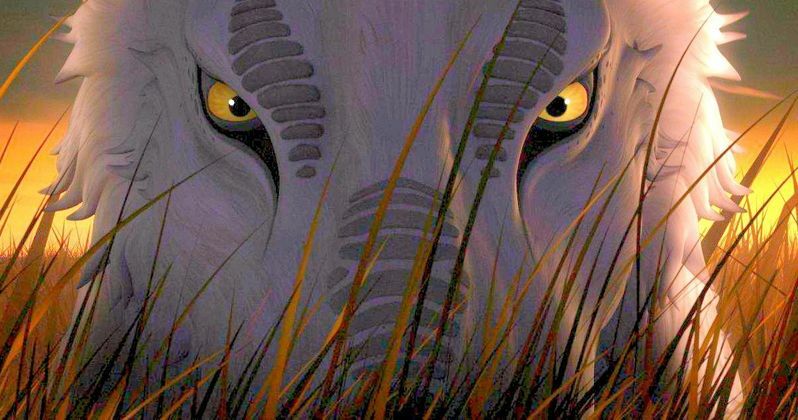 The Dume wolf tells him that it is from the Jedi temple on Lothal, that the Empire has discovered it. The wolf continues that dangerous secrets are there. Ezra remembers that Ahsoka said the same thing about the Sith temple on Malachor. Dume whispers one last thing, the past will redeem the future. It goes to bite Ezra, who jumps awake in reality. The tablet is on the ground in front of him. Back in the cave, Hera has added a new totem to the Kalikori. It is in memory of the fallen Kanan. She tells Chopper that she will miss Kanan, he always had the answers. Zeb and Sabine return with the news about the factories. Hera is bolstered by their victory. Ezra also returns with the tablet. He announces their next mission. They will retake the Jedi temple and find the secrets within. So Kanan has become a Loth-wolf. That makes sense, as the series has been building up the wolves for something big. I can't fathom what they'll find in the temple. The markings on the tablet are a total mystery to me. I think that Sabine letting Rukh live will be a huge development. I have a feeling Rukh may return the favor when they need it most. Pryce will surely do something stupid to avoid her "punishment" from Thrawn. Star Wars Rebels thunders toward its conclusion on Disney XD.